A máme tady jednu z prvních kapel pro OEF 2018 a hned vytahujeme z rukávu těžký kalibr. Novodobé krále amerického thrashingu, kapelu LICH KING z města Greenfield ve státě Massachusetts. Založeni v roce 2007 a na kontě už mají šest dlouhohrajících desek a nejen tou poslední, nazvanou „The Omniclasm“, tito mlaďoši opravdu prorazili. Kluci za sebou mají samozřejmě i početné koncertování na americkém kontinentě a také odehraná dvě dlouhá evropská tour. Thrash metal v tradici Bay area kapel jako jsou Exodus nebo Vio-lence s punkovým feelingem, kterou nám předvádí tato pětice, vybízí k zuřivému moshingu a my jsme nadšeni, že Vám je na OEF 2018 budeme moci představit. Zach, Nick, Joe, Mike a Brian se hodně těší na proslulý trutnovský moshpit…my taky!!! 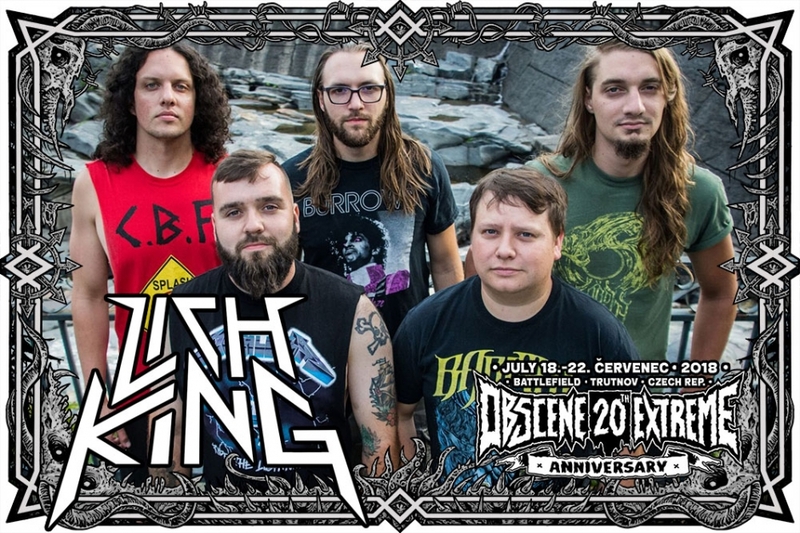 Since 2007, LICH KING have been playing grade-A, unapologetically straight-forward thrash metal in the vein of the 80's Bay Area bands such as Exodus, Slayer, and Vio-lence. Starting out as a one-man project that quickly gained traction in the underground thrash scene, the band has since embarked on multiple tours of the U.S. and Canada and shared the stage with everyone from Overkill to Municipal Waste. To date, the band has released five critically acclaimed full-length albums, each of which feature fast, headbangable riffs in modern stomp anthems and a sometimes comedic yet always violent songwriting sensibility. Also, we have nothing to do with World of Warcraft or Adventure Time, so you can stop asking anytime now. Thanks. LICH KING’s latest release THE OMNICLASM features 10 tracks of aggressive, stompy thrash metal in the old tradition, and marks the band's fifth full-length album and a continuation of their DIY nature with an independent release. As with 2012's BORN OF THE BOMB and 2014's DO-OVER, the new album was produced and mixed by drummer Brian Westbrook (Barishi, Condition Critical) at Sonic Titan Studios, and album art and design were handled by vocalist Tom Martin.